Looks like a cracking tree - biennial cropping is in part about crop management (there are many factors but I'll just stick to this for simplicity). 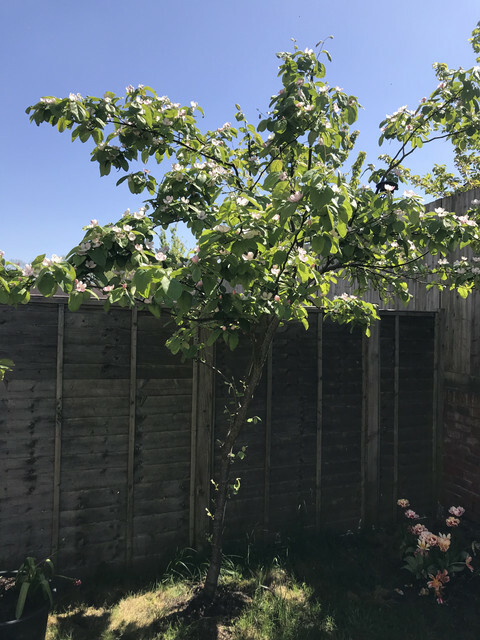 In a year when you get lots of fruit set, go round the tree in late June or early July and take off at least 50% of the fruitlets (can be as much as 90%). This will mean better and larger fruits that year and also allow the tree to have enough reserves left to crop the next year too. Don't stint on the watering in the Summer - quinces love fresh water, as long as its not stagnant. Thanks, although i can't take any credit as that's how i bought it lol. The leaves were more upright when i 1st received it but they are drooping down now, i was a little concerned but it seems most of the quince tree images I've seen online have similar hanging leaves. I was thinking of tying down the side branches a little to encourage it to spread out more but haven't decided. I know tying branches down is supposed to encourage fruiting but hopefully it doesn't reduce tree growth. Thanks for the tips, I'll be sure to keep them in mind for when the tree starts fruiting, will also be sure to regularly water it. You're very welcome. The feedback system in trees that regulates growth, which is what re-acts when you tie down a branch for example, is a pretty complex subject and one which I think is still being studied by scientists. If you want to encourage fruiting and open the center of the tree a bit, I'd definitely advise tying down as the best method. It will mean you get a bit less extension growth, all other things being equal - if this worries you, adding some stable manure as a mulch or watering in some liquid fertiliser once a week, will balance up things. 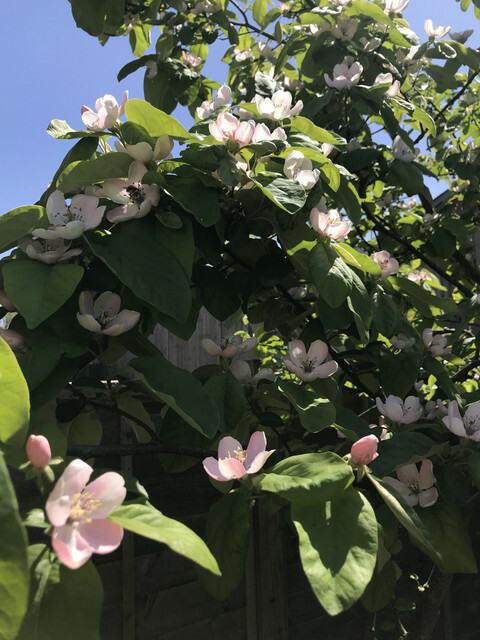 My quince tree is in full bloom. rinabean, Babru and Fruitz like this. I'm planning on feeding it and using liquid seaweed foliar spray anyway so hopefully won't lose much growth. Looking good, mine came in to full bloom today too due to the nice sun we were having. Have you measured the tree by any chance, just wondering how tall it is to produce that much fruit as it doesn't seem to be overly wide. Also is it just the timing of the pictures or do you have it in a shaded spot? Looks more or less what I'd have done, and you have a lovely sunny spot, so fingers crossed years of fruiting to come. Just one point, there seems to be an almost vertical central leader branch ( maybe in part a trick of the angle the photo is taken from). There's nothing wrong with this as such, but it can be that that branch will dominate the res of the tree in time. It mostly then depends on whether you are happy with that look (bit more Xmas tree shape) or whether you want a more open tree (upside down umbrella) - if you chose the latter, then either next year or a bit later, a good part of that central branch will need to be pruned out. That fence is 5ft tall so tree is about 10ft. Fence is on the east side and right of the tree is south, so tree has full sun. Is there a way to learn what rootstock it is? I just learned there are different types.